Every leader understands the burning need for change–and every leader knows how risky it is, and how often it fails. To make organizational change work, you need to base it on science, not intuition. Despite hundreds of books on change, failure rates remain sky high. Are there deep flaws in the guidance change leaders are given? While eschewing the pat answers, linear models, and change recipes offered elsewhere, Paul Gibbons offers the first blueprint for change that fully reflects the newest advances in mindfulness, behavioral economics, the psychology of risk-taking, neuroscience, mindfulness, and complexity theory. Change management, ostensibly the craft of making change happen, is rife with myth, pseudoscience, and flawed ideas from pop psychology. 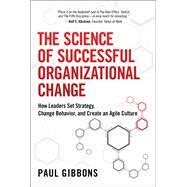 In Gibbons’ view, change management should be “euthanized” and replaced with change agile businesses, with change leaders at every level. To achieve that, business education and leadership training in organizations needs to become more accountable for real results, not just participant satisfaction (the “edutainment” culture). Twenty-first century change leaders need to focus less on project results, more on creating agile cultures and businesses full of staff who have “get to” rather than “have to” attitudes. To do that, change leaders will have to leave behind the old paradigm of “carrots and sticks,” both of which destroy engagement. “New analytics” offer more data-driven approaches to decision making, but present a host of people challenges—where petabyte information flows meet traditional decision-making structures. These approaches will have to be complemented with “leading with science”—that is, using evidence-based management to inform strategy and policy decisions. To link science with your "on-the-ground" reality, Gibbons tells “warts and all” stories from his twenty-plus years consulting to top teams and at the largest businesses in the world. You'll find case studies from well-known companies like IBM and Shell and CEO interviews from Nokia and Barclays Bank.